King Krule’s long-awaited album ‘The OOZ’ will be released October 13th on True Panther Sounds in North America and XL Recordings in Europe. Those who have been particularly anxious for news about this release will be very happy to see some of the details for the release below (including the 19 song-long tracklisting…) Before you get to to that, here’s some more info about The OOZ. “One of the most celebrated figureheads on the independent British scene, Archy Marshall returns with the dense, sprawling The OOZ, the much anticipated follow up to his debut Six Feet Beneath the Moon. 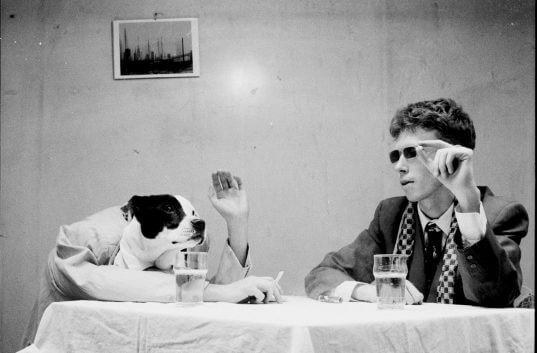 Drifting and seeping through the cracks of South London like the album title, King Krule casts an unflinching eye over his kingdom, transforming his observations of all the disorientation and heartbreak of his youth into piercing narratives and poetry that are both startlingly honest and brutally beautiful. With The OOZ, Marshall finally takes the crown as poet laureate for the dazed and confused generation, painting a bleak and sometimes harrowing picture of a rapidly splintering city. Where Six Feet Beneath the Moon, released in 2013, was a rigorous, rambling excavation of Marshall’s expansive body of work to date, The OOZ snaps into focus quickly and sharply, his modus operandi coming into view almost immediately. Over jazzy curlicues and guitars, the opener “Biscuit Town” sets out its stall irresistibly as Marshall sings about rapidly disintegrating romance and personal dissolution with acute, almost painful detail. These wrenching themes of self-annihilation and fraying relationships seem inextricably linked in Marshall’s eyes – once you lose yourself to someone else, you inevitably wind up losing yourself completely when they leave – and recur in other tracks. “Why’d you leave me? Because of my depression? You used to complete me but I guess I learnt a lesson” he spits on the roiling “Midnight 01 (Deep Sea Diver),” and, even layered with the warm vocals of Okay Kaya, “Slush Puppy” is an unsparing dissection of a couple with nothing left to give, like a Gainsbourg and Birkin ballad gone toxic. Elsewhere, things only get darker, as Marshall desperately tries to find safe harbor in the city he knows and loves, only to be thwarted constantly, as on “The Cadet Leaps” and previously released single “Czech One.” Not even the synthetic high of chemicals, as shown in “Emergency Blimp” and “A Slide In (New Drugs)” can stanch the suffering.